I have been visiting with Claude Monet since I was a teenager, even before I knew who he was. 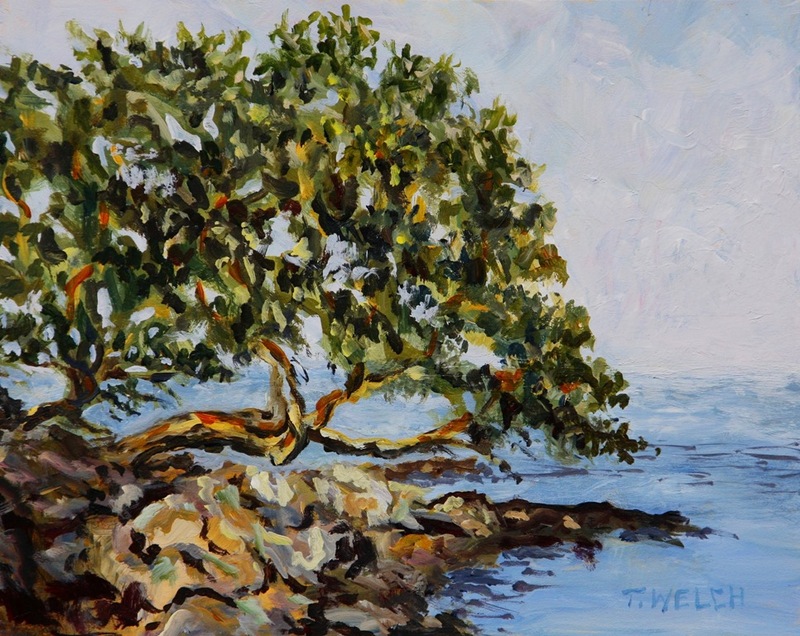 “Late Morning in August by the Sea” – 9 X 12 inch oil on canvas, not for sale. So strong was Monet and the other Impressionists’ influence of our understanding of light colour that is likely true for many of us. 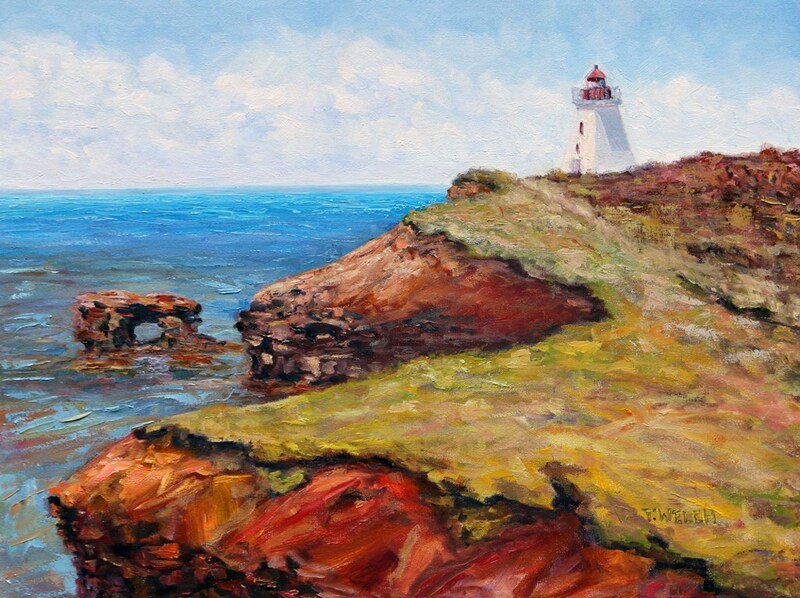 In my first oil painting classes at 14 years old, I remember the process of underpainting and then following the light in patches and shapes of colour across a whole canvas building it up to the same level of completeness at once. I remember the joy of mixing the pigments right on the canvas as I went, layering them wet-into-wet until I was satisfied with the end result. The paintings weren’t much – the work of a child learning her craft. But the process, oh how I loved the process! These were evening classes or Saturday classes and work was created from memory or reference images mostly. At home though, I worked mostly from life, observing the fast moving light and seasonal changes. This is still a significant part of my painting practice today more than forty years later . 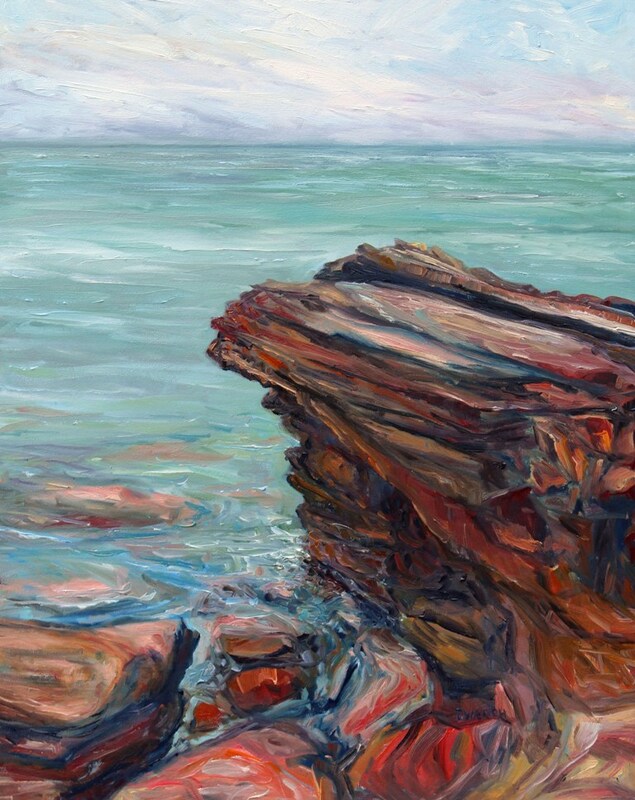 Finishing “Melancholy Seas” – 14 X 18 inch oil on canvas, available. What was missing in this early education was explaining to me that the oil painting approach I was using was that of the impressionist painters and Monet in particular. Or possibly, I was too young to remember as I was too busy actually painting. 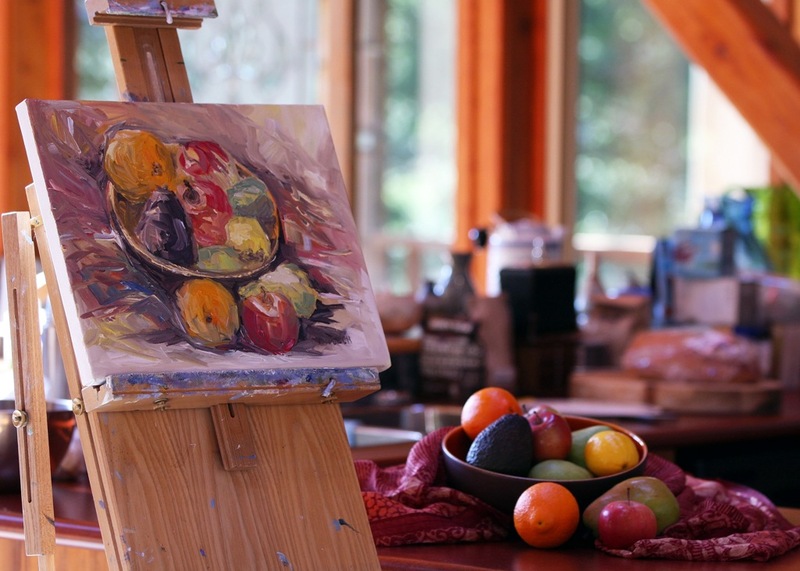 Whatever the reason, it would be many years before I realized that my approach to oil painting and painting in general came from this specific school of understanding light, colour and shapes. So, in this way, I first visited with Monet without even knowing his name. 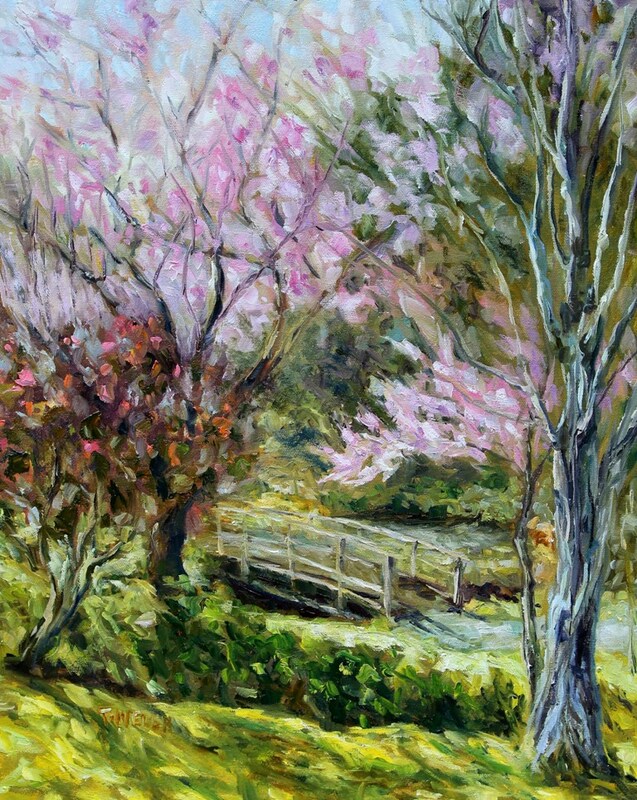 Plein air painting “Early March Snow Japanese Garden Mayne Island B.C.” Walnut oil on gessobord, available. Since then, I have read whole books about his life and work, studied many images of his paintings, taken in talks by art historians and seen his paintings in person in Toronto, Canada and Paris, France and Basil, Switzerland. To say that his work has had a profound influence on my approach to painting may be taking it too lightly. 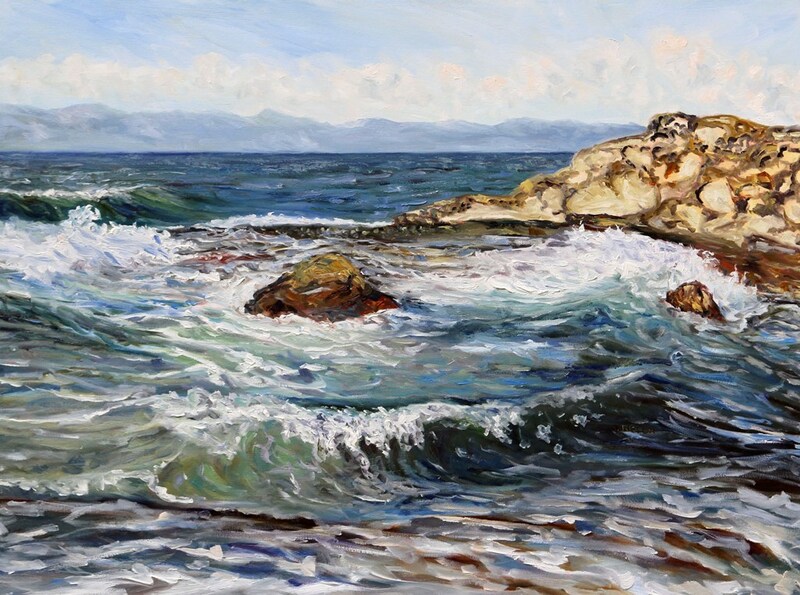 People teasingly call me “the Monet of Mayne Island” with good reason! At one time, in the summer of 2012, I even vowed (unsuccessfully) to divorce Monet and shake his hold on my painting hand. I argued and demonstrated the strength of letting the darks be dark. 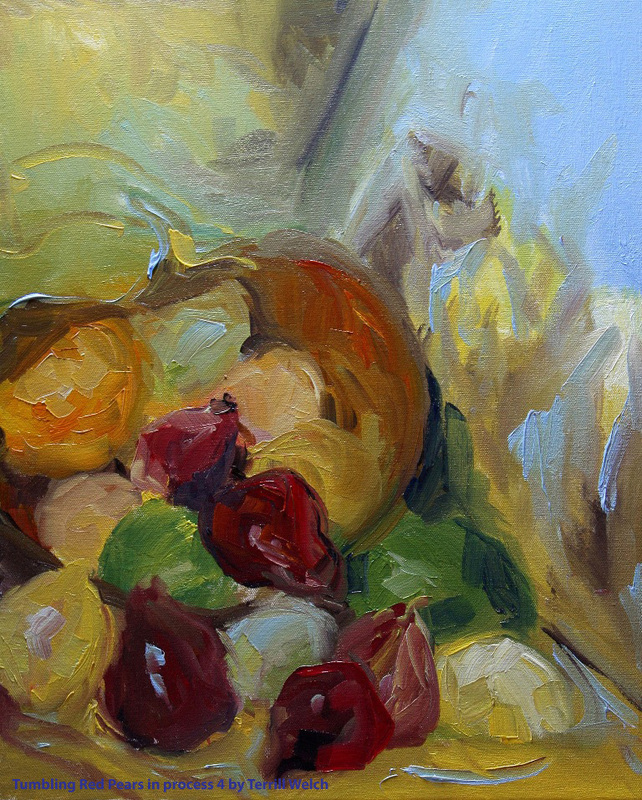 I pointed my brushes towards Cezanne and the necessary strength and influence of form. But it was no use. 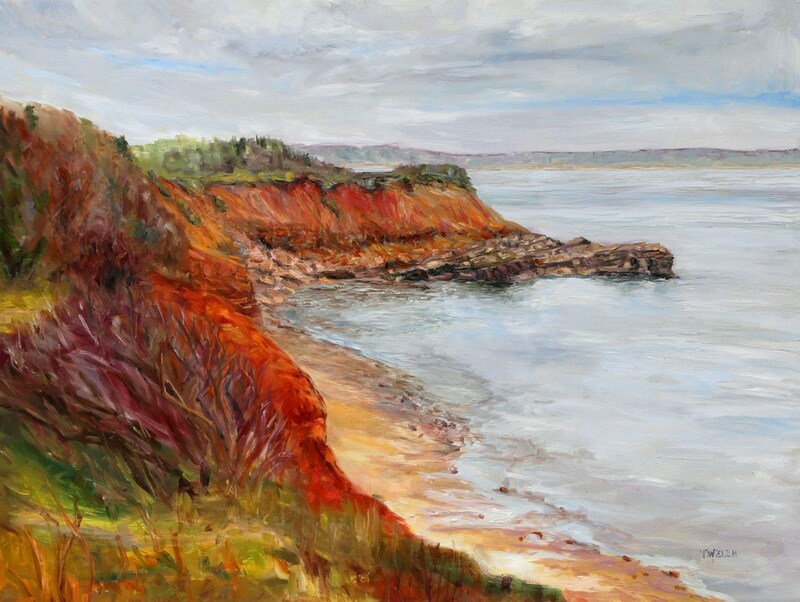 “Blooming Point PEI” 8 X 10 inch acrylic plein air sketch, not for sale. In my mind’s eye, Monet lightly shrugged and went back to painting his pond, the light through the trees and the lily pads. Over time, I conceded to my love affair with light, even in the shadows. Hence, though we have an amenable separation, Monet’s painting process and sensibilities and my own painting practice will never be divorced. The confluence of history and our mutual love of light and colour has not allow it, at least not yet. 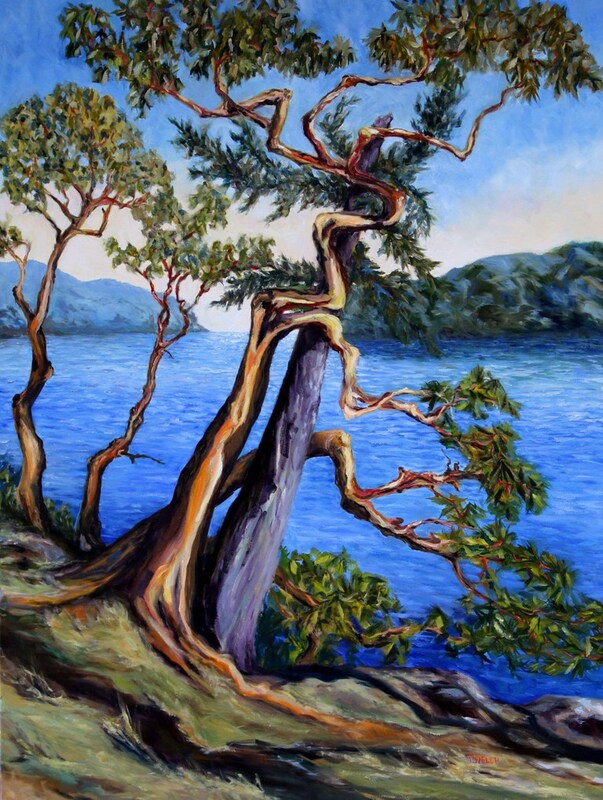 “Storytelling Arbutus Tree Bennett Bay Mayne Island B.C.” 60 X 40 inch oil on canvas, available. So Monet and I have visited again, yesterday, at the Vancouver Art Gallery where 38 of Monet’s paintings are on exhibit. Later, I shall decide if we have more to say to each other. For now, this is enough. What great master in your field of expertise has visited with you the longest? Let’s light the wood cook stove in the outdoor courtyard while a gentle rain wakes nearby tree frogs. While you are listening, I shall split some wood and set out the makings for tea. There are a couple of cushions on the cob bench that are just right for us. Now, I mentioned a few painting secrets didn’t I? To refine this just a little – these are this particular artist’s painting secrets that I am referencing, not the generic painter from all genres and all times. Lastly, they are painting secrets only in if we haven’t yet taken the time to consider their relevance in relation to our painting language. The first painting secret is to hold a tension between knowing and the unexpected. To clarify, I don’t really believe in divine intervention or creativity passing through me from some higher power. Admittedly, my conscious mind is seldom in control of my brush except as I begin and at the completion of a work – so possibly “belief” is irrelevant in this situation. However, I start with an intention. 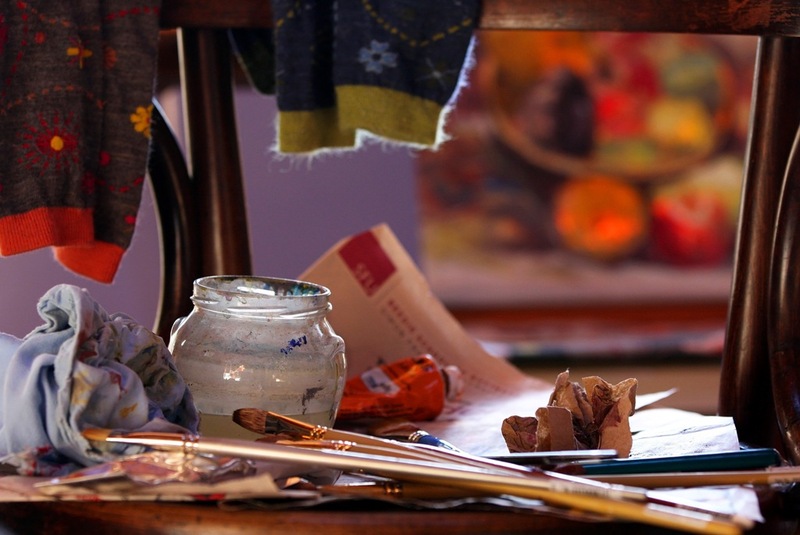 I choose a subject, a medium, a surface and an approach or painting problem. I decide which pigments to set out. This is the “knowing” part of the equation which is heavily influenced by frequent practice such as with this first of two acrylic painting sketches from yesterday. This painting sketch didn’t come out of nowhere. Even though it was painted in the middle of an indoor market day with not a glimpse of the foggy sea visible, the sketch is inspired by an experience from the day before. 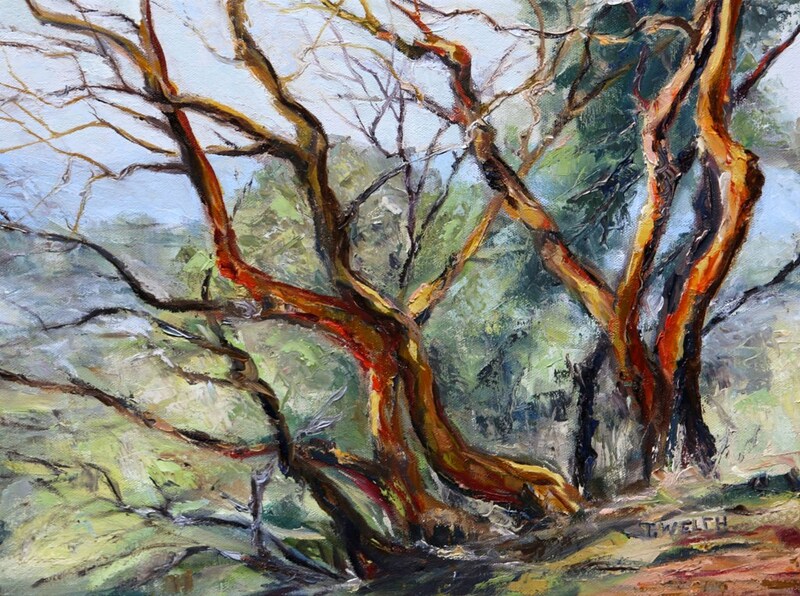 While walking, a friend asks if I had done a painting of this particular arbutus tree. I reply – not yet – as I frame my composition – maybe tomorrow though – and the shutter releases. It is these slivers of moments overlapping one-over-another that find their way onto my canvases. How do I capture our relaxed ease which followed from lunch together and now an afternoon January stroll around a small piece of our island? What colours and brushstrokes will translate these feelings, this remembering? 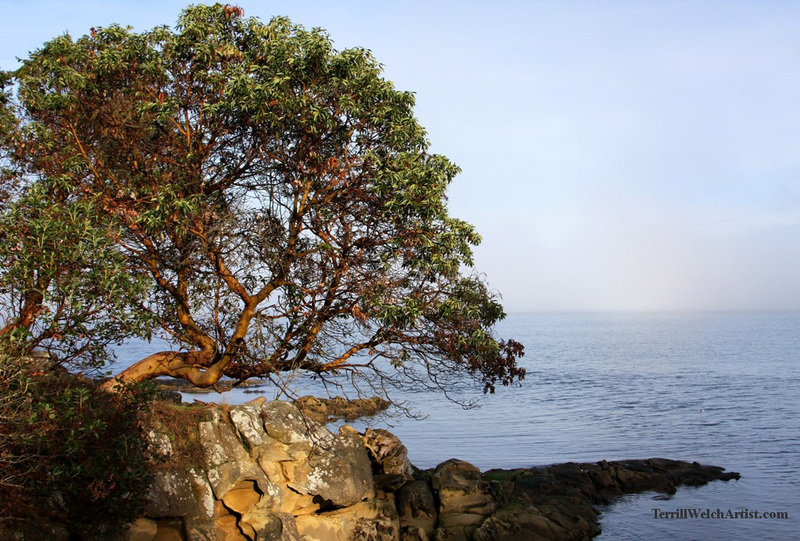 It is so much more than this arbutus tree hunch over the sandstone shore, where the sun catches and the fog shifts upon the sea. This painting sketch is a first attempt to answer these questions. I really haven’t a clue what the answer is but I find I must set myself to the problem just the same. This is the “unexpected” half of the equation. I must move forward without knowing. I believe this is where some painters and creative beings feel they are merely a vessel for the work to come through. I am not convinced. The focus and full-body experience as the brushes move paint onto canvas is undeniable and yes possibly spiritual in approach. But I still claim awareness of my physical presence and leaning heavily on a large basket of experience both from painting and from life. 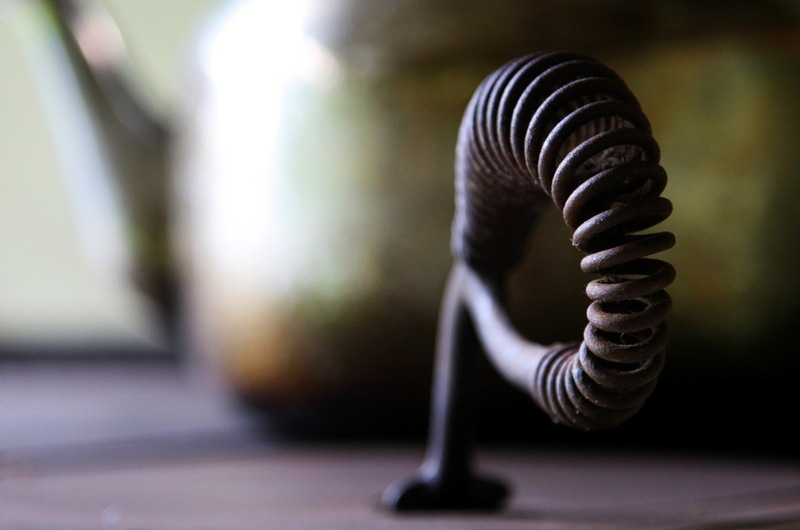 The unpredictable combination of these elements is what is leads us to the unexpected. It is the tension between this knowing and embracing unknown possibilities that is important. To achieve results I must show up and practice my craft frequently. Relying on divine intervention will only get us so far. Then there is work to be done. 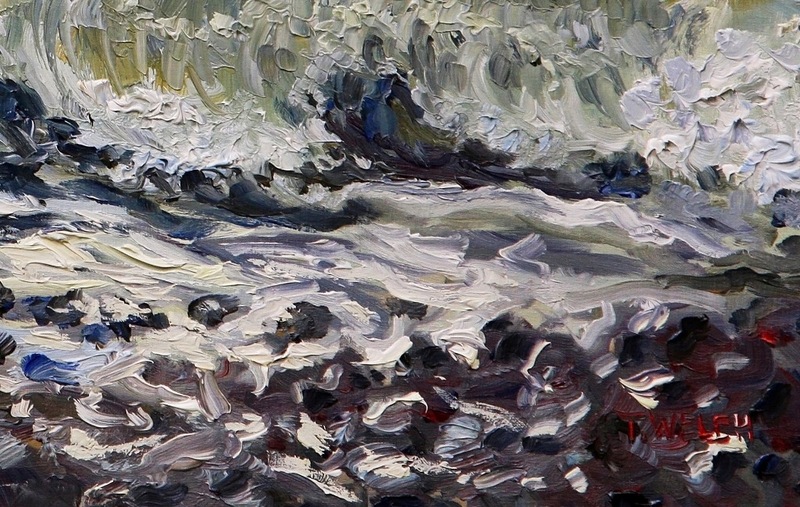 The second painting secret is finding precisely the intimate details that are essential. Then I paint these aspect with all of my senses and layers of brushstrokes to expose this specific intimacy. 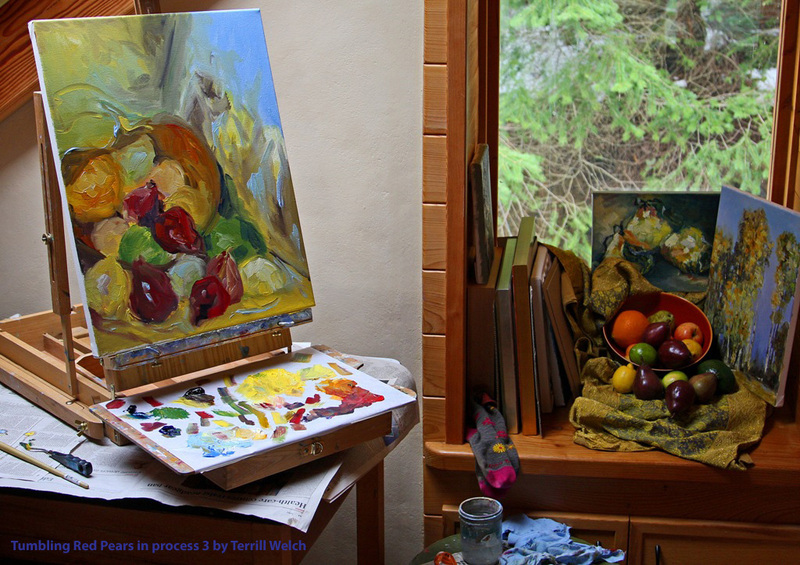 For a landscape or still life painter there is always movement even when it is not at first noticeable. This is because the earth is moving. This grants us a readily identifiable intimacy in our relationship to a precise aspect of that time of day, a specific season combined with our years of experience with this spiraling cycle. These years of experience I reference are is “noticing years” rather than “birth years” which is significant. Currently, with the amount of time humans spend in artificial environments, a person can go their whole life with little conscious awareness and possibly no interest in our earthly relationship in the universe. 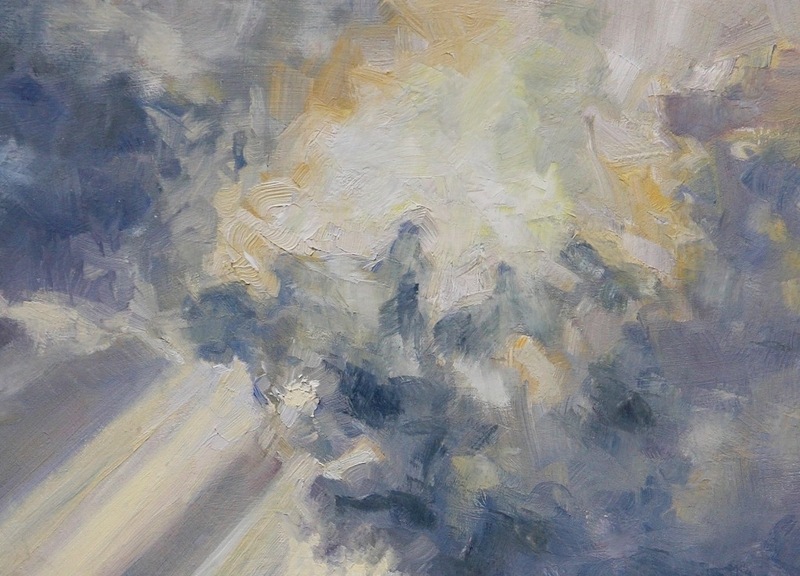 We must notice in a conscious way in order to deepen and strengthen our painting vocabulary of movement and the interrelationship of light and our subjects. I sense this to be true even in abstract work. The paintings of Richard Diebenkorn whose work will be shown at the Royal Academy in London England March 14 to June 7 2015. Yet, though our urban surroundings mask our awareness to nature, it takes very little to awaken these sensory experience. Repeated deliberate observation is all that is really necessary. 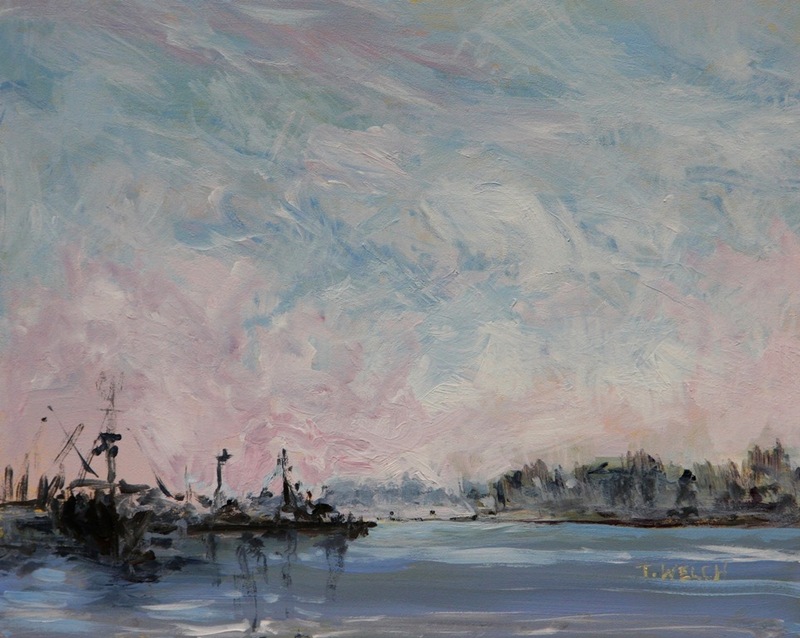 Take this second painting sketch “Steveston morning fog” an 8 x 10 acrylic painting sketch on gessoboard. 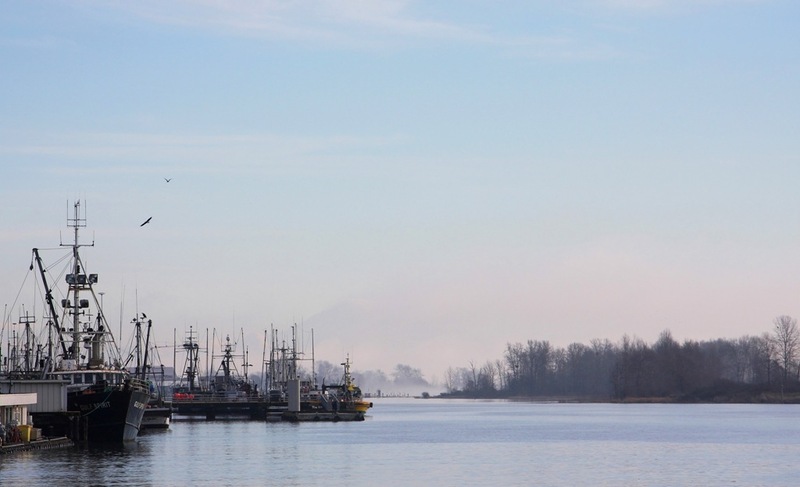 The fishing boats are important but they do not float on their own in the morning fog. They are imbedded in their surroundings and are experienced as small against a grand sky that touches right down to the sea. I made them even smaller in relationship to the sky for this reason than my photography reference information. Maybe even too small perhaps. However, in this translation of my experience it is our human smallness in relationship to the sky and the morning light coming through the fog that was the intimate detail of significance. The third painting secret I have to share is to release any notion of importance. We must take our work seriously of course but release any investment in a particular outcome of success, recognition or fortune. This doesn’t mean we relinquish these things completely but rather that they remain outside of the painting process and, as much as possible, outside of our lives in general. Yes, well-being is important. Yes, we desire and do much better with safe secure housing and nutritious foods. Yes, we need social appreciation and connection to varying degrees depending on our own temperament. But we need much less of what is defined as success, recognition and fortune than we are led through advertizing and media to believe that we do – particularly in North America. For example, my large old tea kettle has out lasted five electric kettles which I somehow thought were necessary. I gave up on the latter about three years ago. They were costly, environmentally unsustainable due to their continued need for replacement. But I had decided for some reason that the electric kettle was faster and easier to use. In reality not so. Water boils in about the same amount of time whether in the kettle on the stove or with the plug-in variety. There is nothing helpful about having this extra contraption on the counter. I had unwittingly replaced experience for efficiency which if I unravel brings us back to the notion of my importance. I had important things to do so the most efficient path was the one that was most desirable. Hence, I purchased a series of ill considered electric kettles. 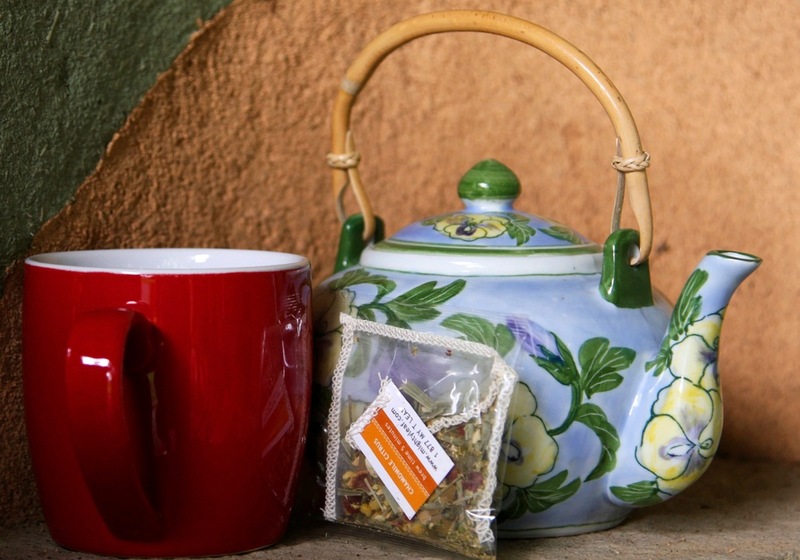 Let’s explore what we notice if we value experience over efficiency as we prepare and drink this cup of tea because this old wood cook stove still makes a fine cup of tea though it will take us about three times as long by the time we get the fire going and the water boiling. When I am sitting here in the outdoor courtyard I have no trouble at all remembering that the earth is on its winter turn and half way to spring. I can almost feel the trees releasing the oxygen I pull deep into the bottom of my lungs. This awareness is far more valuable to my painting than the importance of a huge following on social media, a cover feature in a national paper or financial wealth. The turning of the earth, the trees, the following, the national article and financial wealth are all temporary – just as we are. Therefore, I suggest that our attention is best spent on insuring our minimal needs while affording us as much freedom to be aware of our relationship to our environment as possible. And here is the rub – insuring minimal needs may requiring marketing and selling the paintings that are rendered in these passages of freedom awareness we have created by attending to only our minimal needs. Still I will argue that success, recognition and fortune are not an adequate definition of a painter and are useless and possibly harmful aspect to attend to as an artist. They are distractions that defuse our attention from our own temporariness. Resisting mortality is futile. Success, recognition and fortune are temporary observations that spiral around through time, for only a short while. Then these observations, along with the physical paintings will disappear just a we did maybe a few hundred years before. We can’t cheat mortality and the effort to stall the inevitable interferes with what must be painted today. With these three secrets, the waves can then roll as if moved by our breath. The sky can open up as never before remembered. There is this almost inevitable flavour of self-display in writing (and showing paintings) publicly, and I am extremely introverted — I really don’t want any self-display. Even now, a huge part of me would prefer to just shut up and go paint in solitude and silence. Or read something, or listen, or see. But there is also this feeling that Shakespeare, and sonnets, and paintings, and art in general — all these things often thought of as high-brow, inessential luxuries — are in fact urgently relevant to our day-to-day lives, even desperately needed. And maybe — just maybe — I might be able to share something which someone else needs; open some doors, show some pathways to what fills my own life with so much joy and happiness. This is why I’ve decided to structure the site not just around the sonnets, or paintings, but around three themes, which — in one or another way — play a crucial role in everyone’s life: “Self and Consciousness”, “Love”, and “Time and Mortality” (with sub-headings to be added as the site grows). I hope you enjoy reading her writing and viewing her paintings as much as I do. What is one of your creative secrets? How does it happen that a painter notices red pears in the local grocery market? Then without looking at the price, she grins widely, grabs a handful and comments “they are for a painting!” How does this happen? What did she see in those pears that was more enticing than say the lemons or the oranges or that green skin of the avocado? Nothing. She picked up an assortment of these as well. But it was the red pears that she knew where going to be the main attraction. You see, she was caught up in some ideas about “seeing” and realism in a conversation that was hosted by artist and colleague Lena Levin on her G+ profile. Partly because of this conversation, the painter kept thinking as she was painting – what am I seeing? What is the influence of what I have seen before? Where are my mental shortcuts? She has no answers but starts and continues to paint. As is common, there is no drawing to guide her brush. Her eyes must be her guide, along with her experience which is where the problem lies. It is in her experience that the mental shortcuts are developed and her eyes and brush stop noticing and actually “seeing” what is before her. She is even, in her noticing, not looking for details but rather relationships between light, shadow, colour and to-a-lesser-degree form. The painter understand that our brains construct images from rapidly gathered information from small areas that the mechanism of the eye scan and then the optic nerve delivers to the brain for translation and construction of a visual image. However, there is more information that is gather from the painter’s other senses that also assists in these constructed images. To name just a few bits of other sensor influence, there is the smell of the orange and linseed oil, the feel of the fabric and the planks of the wood floor with her bare feet and the sound of water dripping from the eaves. 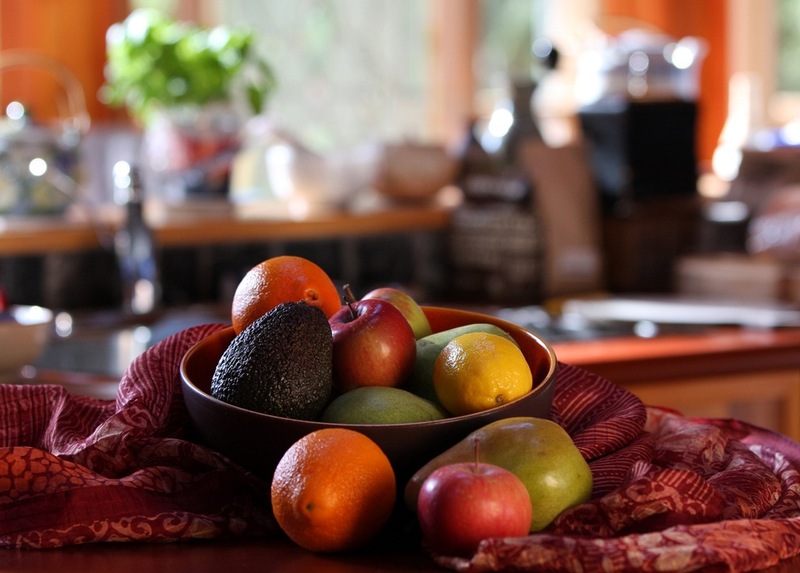 Then too there is all the previous data gathered about what a bowl of fruit looks like. 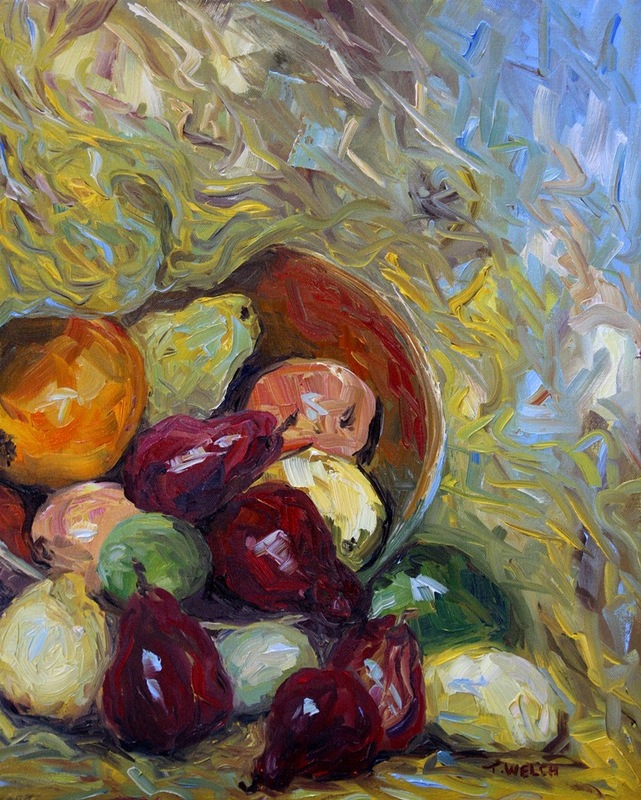 There are all the bowls of fruit ever noticed and seen – both in real-time and in photographs and paintings. There are all the rules and breaking of rules about composition, about the actual process of painting as well as those about noticing, really noticing what she is seeing. Of all of this information, what will be the resulting rendering of THIS still life? Well, the painter did not get very far before she decides to enhance what she is seeing. She adds a lemon on the bottom right. Yes, she says to herself, it should be there. And so it is. What could be the harm of adding one imagined lemon? I mean really. It is only a little bit of yellow right? The painter chooses to ignore that her noticing had resulted in imagining a whole lemon. She determinedly continued to focus on the bowl of fruit. 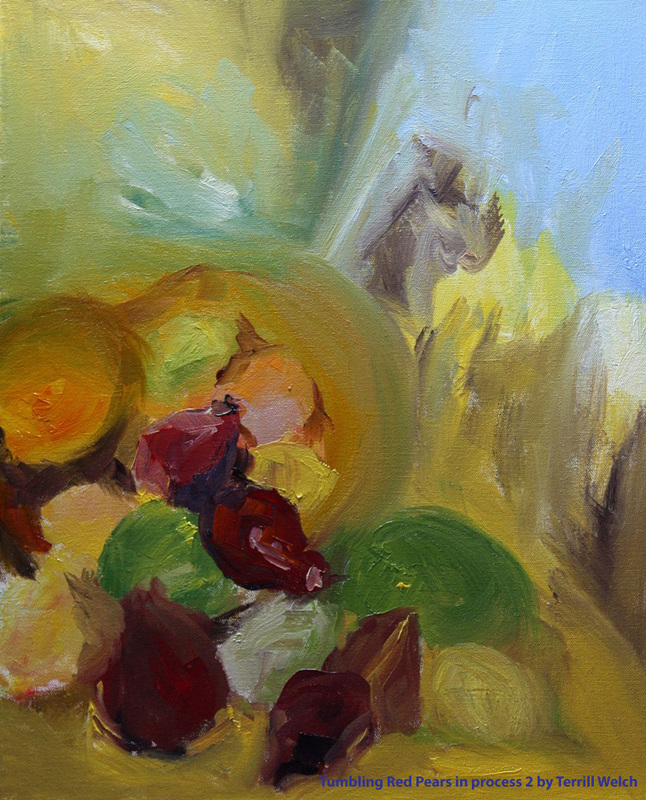 In fact, she focused so hard that the red pears began to tumble forward out of the painting. 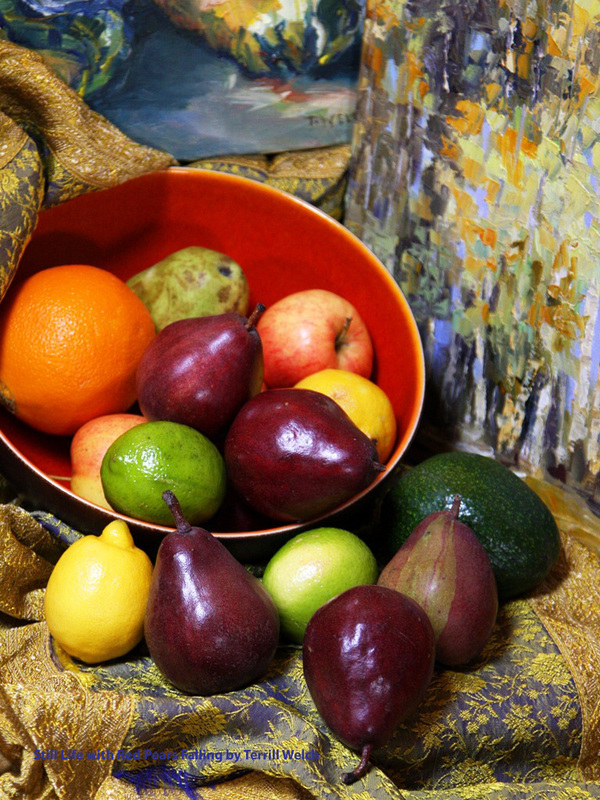 This is about the exact point where the still life painting made a notable separation from its visual reference. It is that blue curving line on the left at about the middle of the painting that did it. Then, without any ability of the painter to rest the brush, another blue line of motion appeared on the bottom right. She knew then that even the slight visual impressions of the paintings in the background would go. 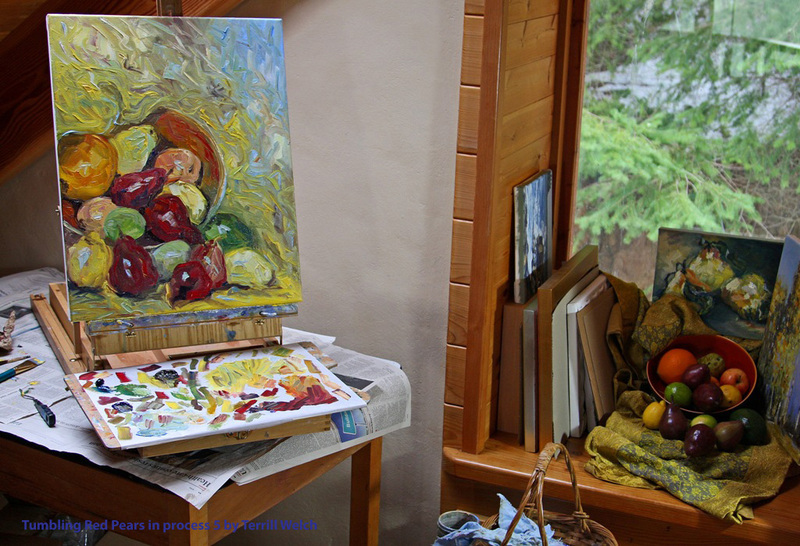 They would be replaced by the gold fabric and the light leftover from the blue in the sky of one of these paintings as an easy reference for the light coming in from the skylight and the window behind the still life set up. This was now a deliberate mental shortcut. Memory and imagination had conquered the physical evidence of what the eyes were actually seeing. 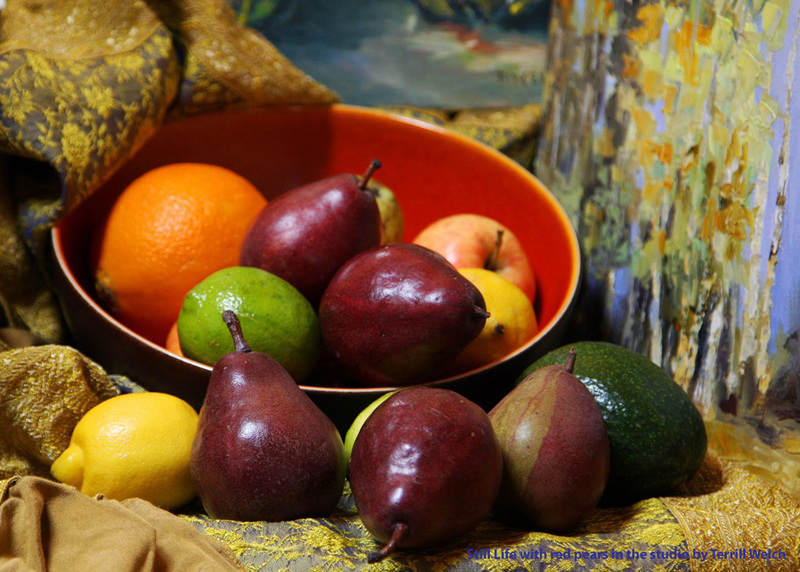 The intention of the painting had clearly become focused on the illusion of red pears falling out of the bowl – a focus that intends to encourage the viewer to hold out their hands and try to catch the fruit before it tumbled out of the painting. The painting is set aside until later in the evening and then, with a few edits that lead the painter’s work through to the next morning, it comes to rest. It won’t be released just yet as the painting still needs to sit for its final photo shoot once the paint is dry. 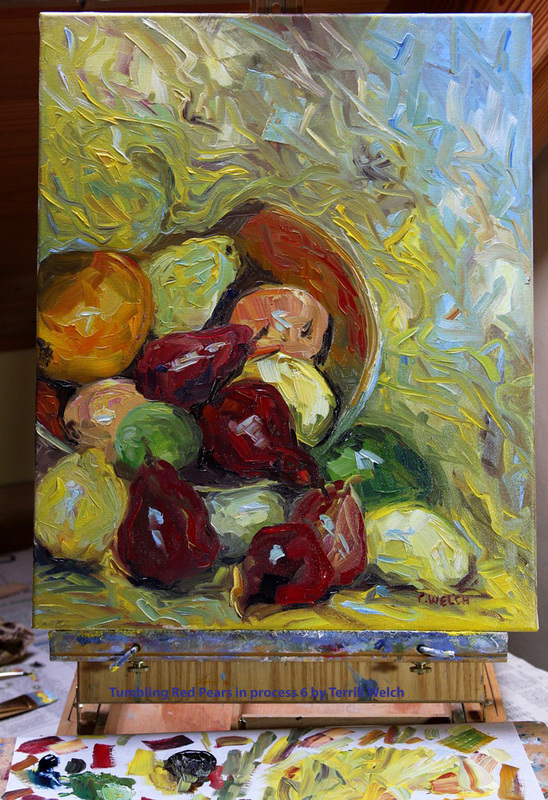 Now we can ask the painter – did you know you were going to paint these red pears tumbling out of a canvas when you saw them in the grocery store? When have you most acutely recognized that you were “seeing” more by your imagination than with your eyes? 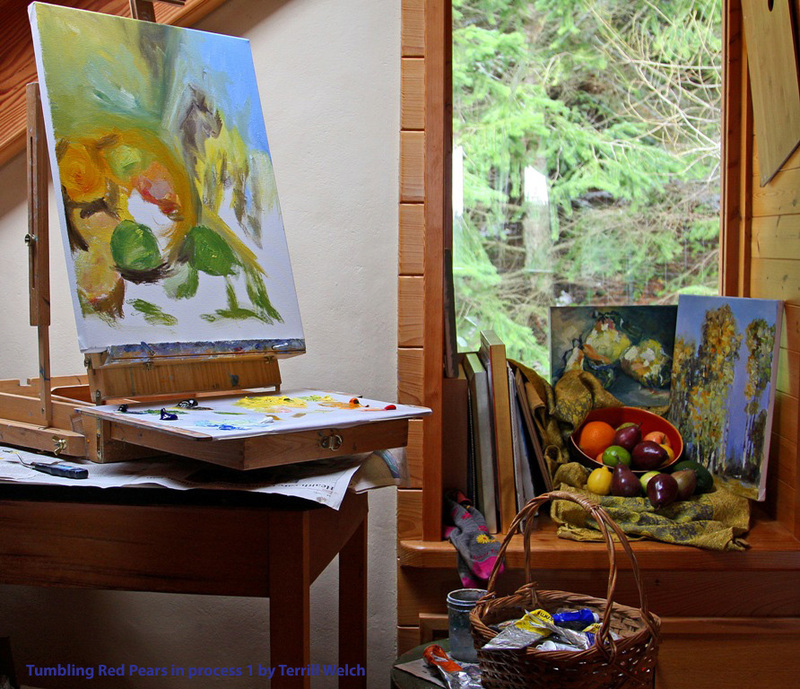 Before I leave us, I want to thank everyone who shared last week’s Art Studio Spring Thaw Event post. Your ongoing support is what warms my heart and also grows the global awareness of my paintings and my photography. Without your efforts my ability to financially sustain my studio practice would be gravely hampered. So thank you, Thank you and THANK YOU! Also, I am lighting a small candle each evening to focus energy on a peaceful resolution in the Ukraine. My mantra is – use your words. Listen and talk it out rather than bully and fight it out. My focus is calming energy sent to Russia’s leadership with this message. However, it isn’t narrowly directed and I disperse it as a blanket over all global decision-makers and citizens. You are most welcome to join me in this practice. I am an artist yes, but I am also more than that. I am a human-being and I desire to live in peace and I desire this for all of us. This, like the effect of full sensory “seeing” in this painting, is a tangible practice in attempting to render my desired reality.